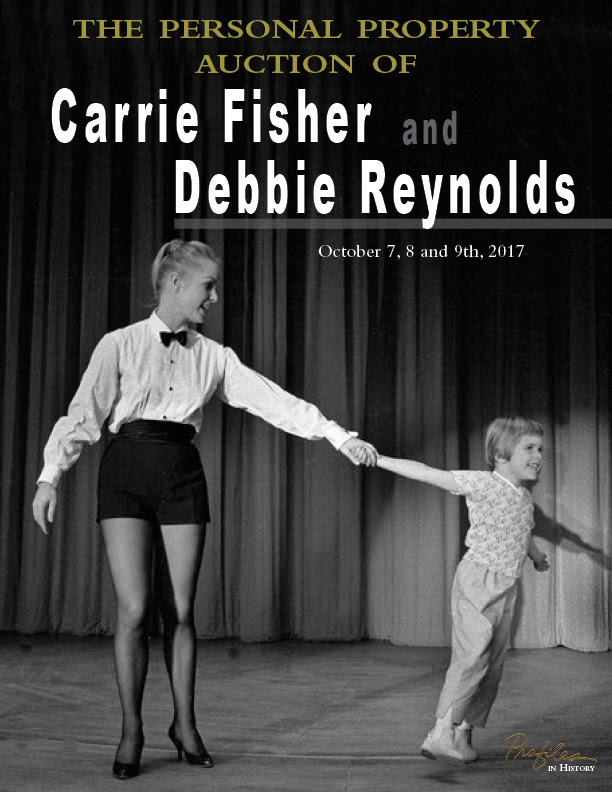 Debbie & Carrie's Prized Possessions were Auctioned October 7, 8 & 9, 2017. For fans of the late mother-daughter duo of Debbie Reynolds and Carrie Fisher, consider this your chance to own a once-in-a-lifetime artifact that played a significant part in their lives. Profiles in History, a popular auction house, announced Thursday that over 1,500 of Fisher and Reynolds's possessions will be sold in an authorized personal property auction on October 7th, 8th and 9th. The public event is being held in anticipation of the duo's legendary Hollywood estate being put on the market—in the heart of Coldwater Canyon with 3.5-acres—which was featured prominently in HBO's recent documentary Bright Lights: Starring Carrie Fisher and Debbie Reynolds. The auction house promises that the items offered will be an extensive mix not only for wealthy collectors, but also for fans "who want to own something special that belonged to Carrie or Debbie." The highlights so far live up to the tease. They include Fisher’s life-size C-3PO with electronic lighting elements; Reynolds’ pair of replica Ruby Slippers from The Wizard of Oz; Fisher’s Biedermeier-style writing desk; Reynolds’ acoustic guitar from her stage shows in Las Vegas; and Reynolds' vintage original half-sheet movie poster for Singin’ in the Rain. "My mother and sister were magnificent collectors, they amassed an amazing and diverse collection in their lifetimes," Todd Fisher, Reynolds's son, said in a statement. "The size and scope of their collection rivals most museums. So in keeping with my mother’s wishes we have decided to share part of their magnificent collection with all their friends and fans." © 2018 HMPE. All Rights Reserved.